As announced at Rose City Comic Con, Dark Horse will unleash its latest superhero early next year! 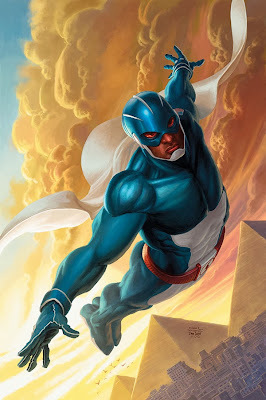 Joshua Hale Fialkov (Tumor), Eisner nominee and writer of the Emmy-nominated animated film Afro Samurai: Resurrection, is set to pen a brand-new series from the pages of CaptainMidnight—Skyman! Catch Skyman’s first appearance in Captain Midnight #4, October 30th!